I love scallops. Once I started cooking them, I had scallops for dinner 5 days in a row. A quick seer is all I usually do. No additional sauce until a few days ago . . . Two of my favorite food blogs, Proud Italian Cook and Ciao Chow Linda, both featured Scallop Piccata, and I had to try it right away. Imagine juicy scallops, lightly crisped, topped with a rich lemon-butter-wine sauce. The capers add a saltiness that drives me crazy. Serve over angel hair pasta. Money! 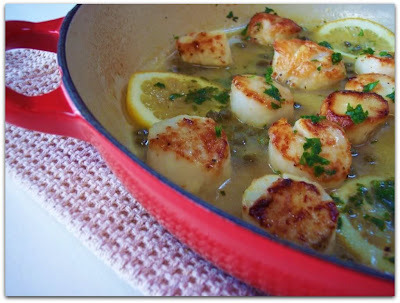 Scallop Piccata Serves 4 people (4 scallops each) 16 large sea scallops flour for dredging 2 tablespoons extra virgin olive oil 3 tablespoons capers 1 cup dry white wine 1 1/2 sticks butter 1/2 cup flat Italian parsley 1. Pat scallops dry with towel and lightly dredge in flour. 2. In heavy bottom/cast iron skillet, heat olive oil over medium high heat. When oil is smoking, add scallops. Cook for 2 minutes on each side, or until lightly crispy brown. Remove scallops from pan. Place on a plate and cover lightly with foil. 3. Add wine to pan and scrape up any brown bits from pan. Stir in capers, and let wine reduce slightly. Cook for about 3 minutes. 4. Whisk in butter. 5. Add scallops back to mixture to heat through. 6. Serve over angel hair pasta and sprinkle chopped parsley on top.